Need your Michigan Center floors stripped and waxed? Loyal Leaf Cleaning LLC has been in the Michigan Center floor care business for more than 2 years. For quality floor cleaning, stripping, and waxing for your Michigan Center business, call Loyal Leaf Cleaning LLC for a free floor care estimate: (517) 219-9661. 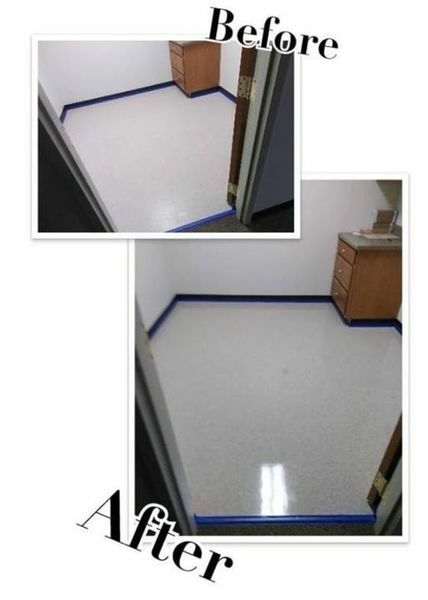 Quality floor care for Michigan Center business. Loyal Leaf Cleaning LLC specializes in floor stripping and waxing for commercial customers in Michigan Center, Michigan. Our Michigan Center flooring crew always complies with OSHA safety regulations. The same process is used whether your Michigan Center commercial floor is large or small. Loyal Leaf Cleaning LLC flooring specialists relocate all office furniture and ensure that caution signs are appropriately placed before beginning the floor stripping process. Our floor cleaners dust mop to get rid of loose dirt and debris. For professional floor stripping and waxing in Michigan Center, call Loyal Leaf Cleaning LLC to schedule your service: (517) 219-9661. 5★★★★★ - "Kristine is a good cleaner." 5★★★★★ - "Quality service you can trust. Affordable, reliable.. will call again in the spring." 5★★★★★ - "They are really nice, very caring and are willing to handle anything that I needed. They really care about the work they do." 5★★★★★ - "She did a great job!!!!!!!!" 5★★★★★ - "Christine is an amazing cleaner. She restored my apartment to almost brand new. I would recommend her to my friends. Before she came over my apartment was in very bad shape and it's hard for me to clean because I have health problems. Now it's easier to clean because it's not as bad as it used to be. Loyal Leaf Cleaning saved my apartment." 5★★★★★ - "Mike and his team are awesome at what they do!!! I can recommend them with 100% confidence - YOU WILL BE HAPPY with the end results if you go with Loyal Leaf." 5★★★★★ - "I hired Michael to clean and detail my office. All I to say is... He's Awesome! He makes sure my office is cleaned and cleaned the right way. He touches every wall to make sure there's no cobwebs or dust hidden anywhere. He even polishes my wood tables and details my picture frames. I would highly recommend Michael's cleaning service." 5★★★★★ - "Great Job Michael! My Office looks and Smells Great." 5★★★★★ - "Our office was in pretty bad shape. Working magic is an understatement. An absolutely wonderful job. Michael is an honest professional, reasonably priced, and the work he does is incredible, I am sold." 5★★★★★ - "Loyal Leaf did a great job, very thorough and worked on 4th of July! Helped us out in a pinch and they were able to squeeze us in. They went above and beyond. Our building was in rough shape and Michael and his team left it clean as a whistle." 5★★★★★ - "Loyal Leaf is timely, professional and thorough! They did a lot of work in a way I could never have done without them. Wow. Wow.wow." 5★★★★★ - "Michael is a cleaning machine. House looked great from top to bottom. He had clearances, pricing, and checklists for what I wanted to be cleaned. The products he used are eco-friendly and had no harsh smells. If you want a perfectionist to clean your house, he is your guy." 5★★★★★ - "I'm writing this review today because I'm extremely pleased with Loyal Leaf Cleaning. My Apartment is spotless in every room & all the tough bathroom mold an mildew is gone. They got a Loyal Leaf customer for life."